If you need a description in english, we will send it to your mail-adress! 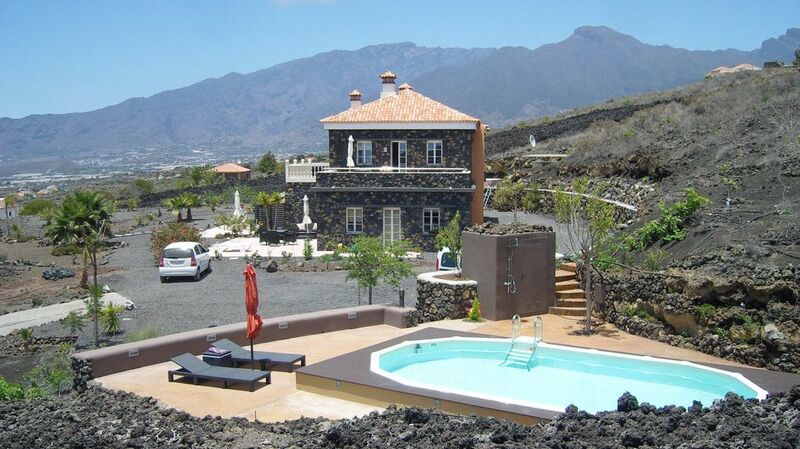 Our apartment (60sqm) with large terrace and large plot is located in a natural stone villa (left detached finca) in the middle of a nature reserve between two lava flows. Fig trees line the 10,000 square meter plot. From the beautiful pool has a beautiful sea view. On the 100 sqm terrace you can watch breathtaking sunsets! enjoy. Since we live in D, you are often alone in the finca. also hilarious table and chairs! White kitchen, bright tiles, white furniture. Of course, all features such as TV, free Wi-Fi, walk-in shower, pool, dishwasher, washing machine, underfloor heating available. How to rent to two people who like to live a little more stylish! Smoking and pets are not allowed! Thermomix available In the finca 4 units are available. Our unit is not seen and you are absolutely undisturbed! Klasse Lage, sehr gute, moderne Ausstattung. Wahnsinnsmehrblick, Südwesten mit untergehender Sonne! Blick ins Aridanetal und die Berge! Super ruhig! Eine perfekt ausgestattete Wohnung, in der es wirklich alles gab, sogar eine gut sortierte DVD-Filmsammlung, eine Terrasse mit traumhaftem Blick, eine tolle Lage, ein sehr netter Verwalter - wir haben eine grandiose Zeit auf La Palma verbracht, zu der diese Unterkunft viel beigetragen hat. Wir würden sie jederzeit wieder buchen. Vielen lieben Dank! Es war ein absolut traumhafter Urlaub! Die Wohnung und die wunderschöne Terrasse haben keine Wünsche offen gelassen. Mit dem Auto konnte man die Insel von dort aus prima erkunden und auch die Betreuung vor Ort war perfekt. Vielen Dank für alles! Tolle, ruhige Lage, alles da, was man braucht! Haben uns sehr wohl gefühlt, kommen bestimmt mal wieder! Vielen lieben Dank für Ihre Bewertung, das freut uns und auch den Besitzer der Anlage . Herzliche Grüße und auf ein baldiges Wiedersehen! Our beautiful apartment is located in the middle of a nature reserve in a villa. NEW: unlimited internet via satellite! The west side is the sunniest side, even if it is cloudy or raining on the east side, the sun is almost always shining here. From the airport through the tunnel to El Paso and then south-west towards the sea is the property with 4 units all to yourself on 1 acre of land and (in winter) to warm 390 m above sea level. One must also not Rtg. North the serpentines Rtg. Tijarafe, but we are perfectly located 10 minutes south of Los Llanos (the second Capital of the island) and 10 minutes west of El Paso (the famous artists' town). of the Caldera 20 min ... etc. We are convinced there is no better location! 180 degree sea view and to the north the mountain panhorama! The next house is 150 meters away!